they say it comes in threes..
Hello everyone! Don’t worry I’ve not forgotten about you, the last couple of days have been a bit manic and it meant I haven’t been in the house much.. hence a bit of blogging silence. Now you should know, I NEVER WIN ANYTHING!! The lovely Lucy from Client contacted me yesterday about the scarf asking which print I would like and if I’d like it to be customised with my initials embroidered! 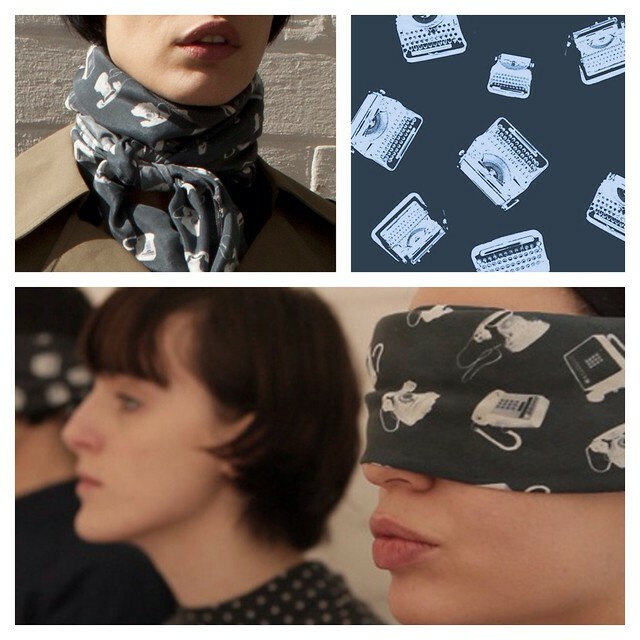 I’ve opted for the typewriter print (being a writer, I thought it was fitting), although I LOVE the telephone print. I actually cannot wait for it to arrive! Expect a lot of gushing and photos when it does! I’m thinking it will fit right in with the Parisian chic look that I’m lusting after at the moment. Thanks for all the words of encouragement about the pattern cutting classes! Part of me is wondering if I’m a little bit mental, especially now that June is looking like it’ll shape out to be a very busy month. Ohh well, if you’re not busy then you’re bored. love your blog, would you like to follow each other? I'll be very glad! I'm all about the typewriters… very cute. Thanks for your blog love on my 'first time thirty' post! I appreciate it very much. Such a cute blog you have. Your choice is PERFECT 🙂 I would have picked the typewriters just because its gorgeous – I to have never won anything so I can imagine your excitement with this all. Congrats, and I hope you get some fabulous wear out of it.